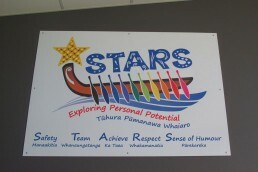 A few years ago Tauranga Intermediate approached us to come up with a concept that would capture their STARS philosophy (Safety, Team, Achieve, Respect, Sense of Humour). 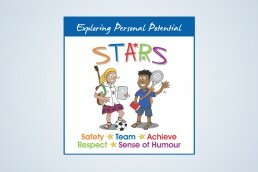 We worked with illustrator Eddie Booth on an image of two children who exemplified STARS and the message “Exploring Personal Potential”. 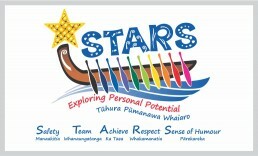 Since then, STARS has evolved and this year we were asked to develop a new logo — one that embraced the meaning of STARS whilst also capturing the historical significance of the land the school resides. Students also had their say, emphasising the importance of the ten school houses and their significance in daily activities. 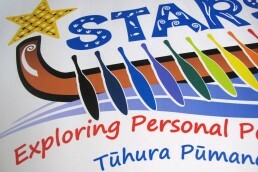 The new logo incorporates a star with a kete design (food basket), a waka, kai (within the text) and 10 hoe (paddles) in the school’s house colours.